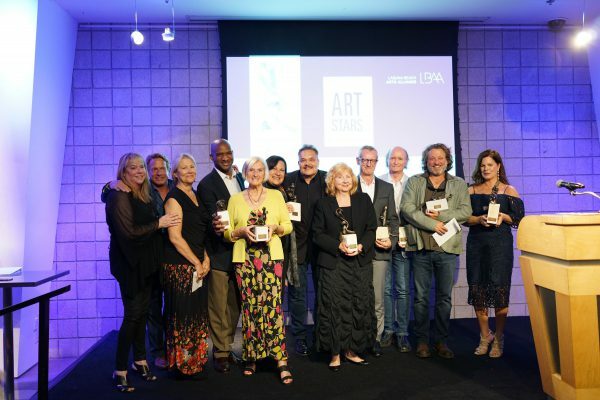 The 2019 Art Star Award winners with guest speaker Marcia Gay Harden (right). Photo courtesy of LBAA. 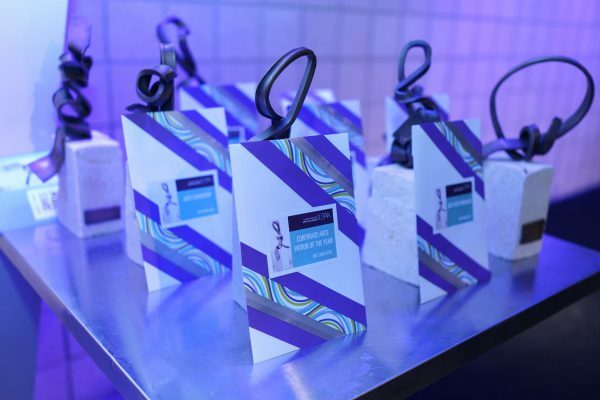 The 13th annual Art Star Awards were celebrated Hollywood-style at [seven degrees] on Sunday, April 7. Over 200 Laguna community members kicked off the event with a red carpet reception and champagne and hors d’oeuvres onthe terrace. Rosemary Swimm,chair of the Laguna Beach Arts Alliance, which sponsors the awards, welcomed the attendees. The Alliance was established in 2002 as a partnership among more than 20 Laguna Beach organizations to advocate for the arts, promote collaboration and networking among the arts organizations of Laguna Beach, and to serve as a united voice for the arts in the city. The Laguna Beach Arts Alliance awarded eight Louies (one-of-a-kind Art Star award sculptures created by Louis Longi) to Laguna’s finest artists, including the inaugural award for volunteerism. Photo courtesy of LBAA. Textile artist, author, instructor, and curator Allyson Allen is the recipient of the [seven degrees] of Inspiration Grant. She uses traditional materials to create dimensional textile art, quilts, dolls and hand-made journals. Her award-winning quilts combine art, craft, research, original design, history and culture in traditional and contemporary pieces. Next year, Allen will present her mixed media exhibit of art quilts and hand-made journals. The Artist of the Year wassinger songwriter, producer and performer Jason Feddy. He has toured with Neil Young, Tears For Fears and The Cranberries. He’s played at every major venue in Britain, including The Royal Albert Hall and has donated his time and talent to help many of the town’s nonprofit organizations, including teaching after school programs at Laguna’s elementary schools and the Boys & Girls Club. Laguna Art Museum’s 100th anniversary celebration won Best Arts Program for their yearlong schedule of commemorative events that engaged the community and were historically informative. A lifetime achievement award was presented to Laguna local Scott Moore, who has been a Festival of Arts exhibitor for 39 years and a Sawdust Art Festival exhibitor for 30 years. He is also the president of the Festival of Arts Foundation, which makes grants available to arts-related nonprofit organizations in and around Laguna Beach, and he serves as vice president on the Festival of Arts board of directors. The Moulton Company was honored as Corporate Arts Patron of the Year for makinggifts to Laguna Beach organizations supported by Nellie Gail Moulton; the Laguna College of Art + Design, and Laguna Playhouse. Chief executive officer of The Moulton Company and great-grandson of Nellie Gail Moulton, Jared Mathis, currently serves on the Board of Trustees for both organizations, and along with the entire Moulton Family, has been an active supporter of Laguna Beach arts. Riggie Horvath was recognized as Individual Arts Patron of the Year who, along with her late husband, Mike, had a vision of creating a quiet, affordable space for a community of artists to create within the city of Laguna Beach and preserve and enhance the reputation of Laguna Beach as a vibrant artist colony. Horvath, who manages Laguna Canyon Art Studios, continues to foster a community of artists in the studio complex by a creating safe and supportive work environment. Festival of Mosaics, an arts program commissioned by the Neighborhood Congregational Church to create a permanent mural measuring 120 feet long on a wall fronting the church on Glenneyre at St. Ann’s Drive, was recognized for Outstanding Arts Collaboration. LOCA Arts Education teamed up with NCC in running public workshops that included tile glazing tile cracking and color picking, puzzle making and on-site installation of the wall. Mike Tauber conceived the Festival of Mosaics, in which 700 people participated. Toni Kellenberg was given an Arts Leadership awardfor her leadership and guidance of the Laguna Plein Air Painters Association, which has more than tripled its membership, increased its mentoring and education programs, added events, and expanded its outreach to benefit artists and the community. Kellenberg has been a volunteer with the Laguna Plein Air Painters Association for more than a decade and continues to be a driving force in LPAPA’s sustainability and growth. For the past six years, she has served on the board of directors as the social media director, and as LPAPA’s president for the last four years. Tribute was paid to the Volunteer of the Year, Sande St. John,who has earned a reputation for volunteerism across Laguna Beach. She is the founding director of No Square Theatre and has served as an event chair for Laguna Beach Live! and Laguna Beach Community Band, where she is also an honorary member. St. John has also been a docent for the Sawdust Festival and an usher for Laguna Playhouse. Her volunteerism earned her a spot on the 2018 Orange County Register’s list of Top 100 Influencers in Orange County.